Comments: The Russian President lets the world know he now has a Aberrant military unit. 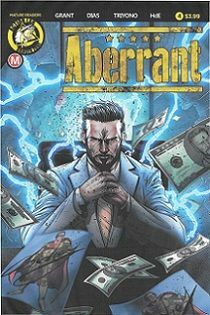 Lance Cordrey is a billionaire and former Aberrant. How the mighty have fallen. He had it all and now only has money. You might even feel a little sorry for Lance. He though is one of the main villains. He is being treated like a puppet by others only this puppet still has real teeth. Lance decides to make a change to his situation. He does just that and does it with a bang. The excitement rockets up and you feel for him. He is doing what needs to be done. This ex super-hero turned villain is creating all kinds of excitement here. It is great to see Lance featured he makes for a wonderful character. The art is done beautifully as it shows off the various people. The music throughout the comic adds a nice touch and gives you something that is so easy to follow along to. This comic does read like a super-hero/action/drama movie. Things pick up this issue for Lance as he goes all out.